Office giant with stamina. 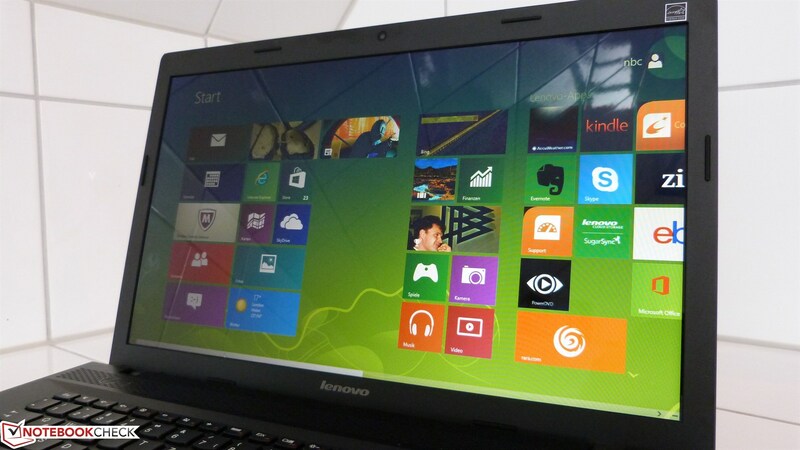 Lenovo offers an inexpensive office notebook with the G700. Despite the good battery runtimes it is however not a very mobile device with its 17-inch display. Lenovo's G-series is the inexpensive entry into the world of 17-inch notebooks and is especially aimed at price-conscious customers. 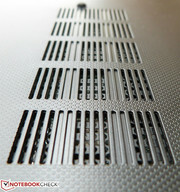 At the same time, the manufacturer promises that the notebook offers sufficient features for all common tasks. Our reviews of G-series devices like the G780 showed that the notebooks are good but not outstanding - despite the better components and the higher price compared to our review unit. 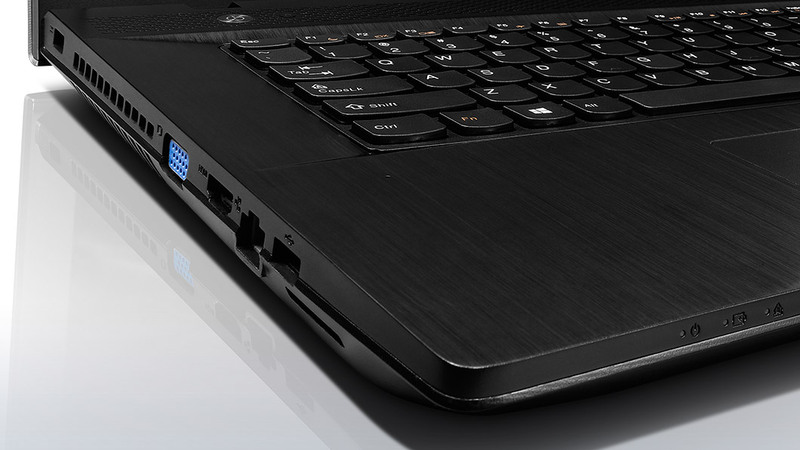 Our Lenovo G700 has a 17.3-inch display and very basic hardware equipment. We review the configuration with an Intel Pentium 2020M CPU and integrated graphics starting at 399 Euros (~$532). The hard drive has a capacity of 500 GB. 4 Gigabytes of RAM are sufficient and one memory slot is even empty and can be equipped with a second module. Convenient for office scenarios: Besides HDMI, the G700 also has an analog VGA port for older displays and projectors. 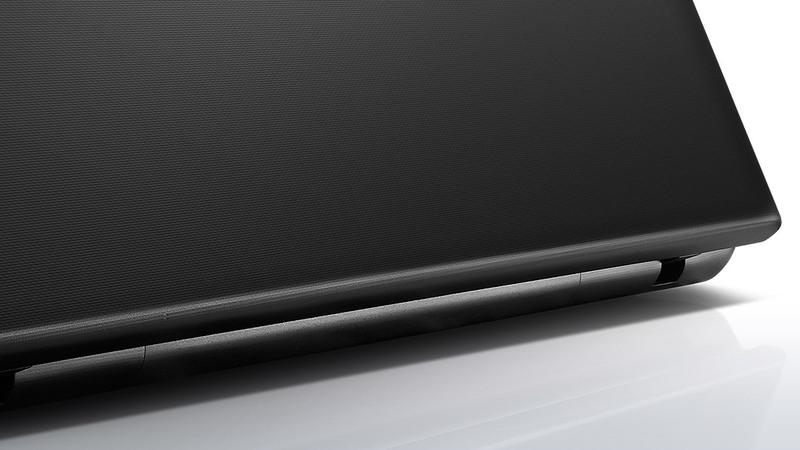 A subtle striped pattern suggests that the case of the Lenovo G700 is made of brushed (black) aluminum when the display cover is open. This is however not the case, the manufacturer uses conventional plastic. The case material easily attracts fingerprints and quickly appears grubby under sunlight. The quality of the display hinges on the other hand is very good - opening the display is comfortable, they keep it well in position and there is no bouncing. Concentrated pressure at the back does not result in color deviations on the display and the cover cannot be twisted either. 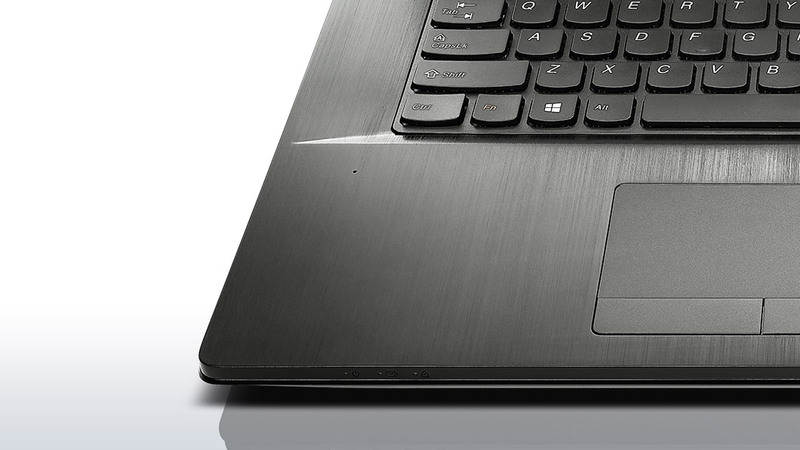 Typical for Lenovo is the low position of the keyboard; the frame leaves a solid impression. The lower positioned keyboard provides a pleasant typing experience but the case can be bent in the keyboard area. Fortunately, this does not affect the typing experience. Removing the battery is very easy and it sits very firmly in the case. The bottom cover is fixed with only two screws; after the removal of the cover, you gain access to the fan and the memory slots. 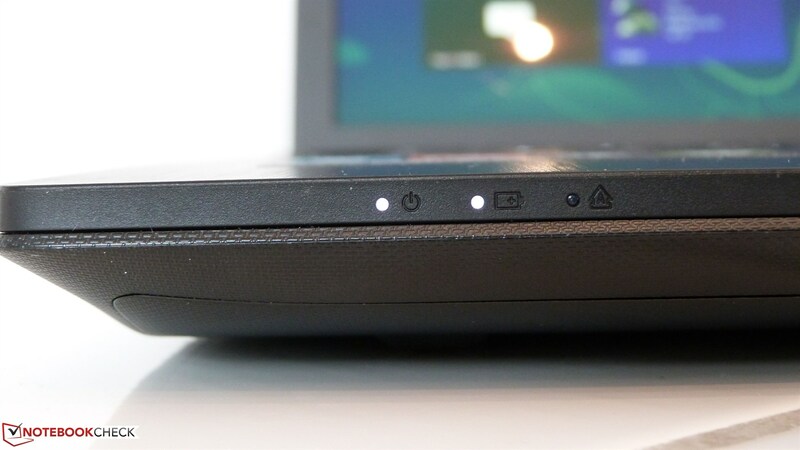 The left side of the Lenovo G700 is not only occupied by the fan exhaust but also accommodates some of the most important ports of the notebook. Besides the rectangular power connector there is also the D-SUB port (VGA) and the HDMI port. Next to it is the Fast-Ethernet port, which is too close to the USB 3.0 port. Bulky USB sticks or other large USB connectors block the Ethernet port and the SD slot. The SD slot is unfavorably positioned and slightly shifted beneath the USB 3.0 port. You cannot insert SD cards if the USB stick is too wide. The right side of the notebook is not so crowded: The two USB 2.0 ports have enough space even for larger USB sticks. However, all the important ports have one problem in common: They are too far at the front of the notebook. A wired mouse or other attached USB devices can affect the usability. Crowded left side: Power, fan, VGA, HDMI, LAN, USB 3.0 and SD slot. Right side: Combined 3.5 mm stereo jack, 2x USB 2.0, DVD and Kensington Lock. The G700 uses a Broadcom WLAN module and only supports 2.4 GHz 802.11 b/g/n networks. The WLAN reception is very weak and it was almost impossible to get a stable signal over several floors. The connection with a Hitron router was only possible for a few seconds before the notebook lost the signal, even with visual contact. The situation was slightly better with a Fritzbox router, but the overall WLAN performance of the G700 is still disappointing. This is extremely inconvenient since the device is not even equipped with Gigabit-LAN for wired networks. Lenovo only integrates a 10/100 MBit adaptor. Lenovo waives the fingerprint reader for the G700, which is common for devices that are more expensive. Apart from the Kensington Lock, there are no additional security features. 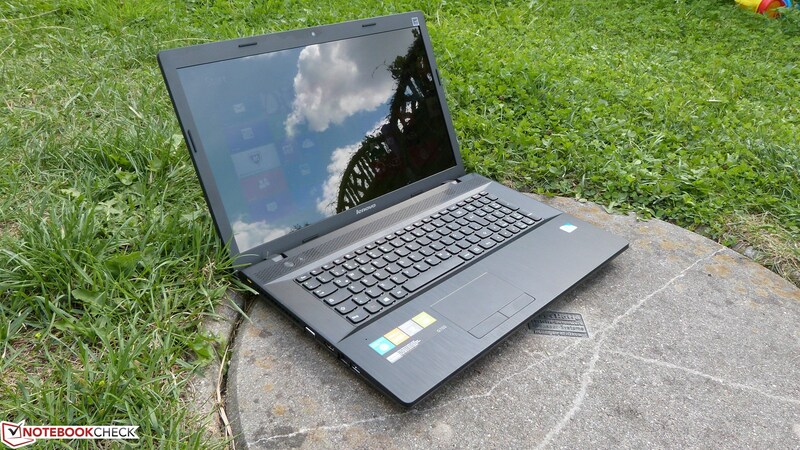 Similar to most inexpensive notebooks, Lenovo does not provide many accessories for the G700. Besides the notebook, the box only contains a power supply unit, a quick start guide and some cushioning material. The manufacturer does not offer a docking station for this notebook. Exemplary, this is the only way to describe the accessibility to the relevant parts and components of the notebook. Just loosen two screws and you can easily remove the whole bottom cover of the notebook - yet it is fixed and secure during operation. After the removal, you can access the memory slots and the WLAN module as well as the hard drive and the fan without any additional work. You can easily clean the fan or even replace it if necessary. Lenovo only grants a 12-month warranty - but the warranty period can differ depending on your region. The chiclet keyboard (Lenovo calls it AccuType keyboard) has sufficiently sized keys and provides a good typing experience. However, the keyboard is slightly flexible in the center and at the sides - it is not too bad and does not affect the typing but it is still noticeable. The key travel is limited and the stroke could be more precise. Compared to other office notebooks in this price range, the overall typing experience is still suitable. Considering the generous size of the 17-inch case, we would have preferred a larger spacing between the numeric keypad and the rest of the keyboard. The arrow keys are shifted towards the numeric keypad - this takes some time to get used to. The touchpad on the other hand is nothing special - its size is sufficient, the surface is convenient and roughened and it has two separate mouse buttons. They are a bit stiff, but that does not really affect daily tasks. We would have expected a bit more precision from the touchpad; the standard settings are also a bit sluggish. The two buttons are very flexible at the sides, which is a bit irritating - this is definitely not a clearly defined pressure point. The keyboard provides a good typing experience. Only the numeric keypad is a bit crowded. 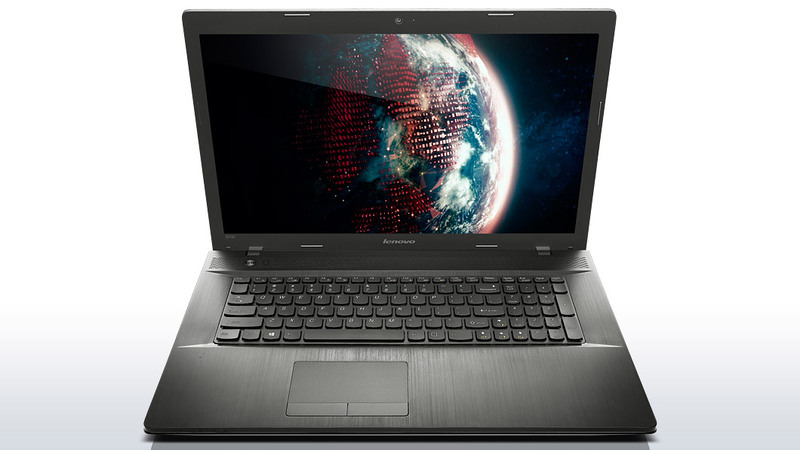 The 17.3-inch display of the Lenovo G700 is provided by Samsung (Samsung KT173KT02) and has a resolution of 1,600x900 pixels. 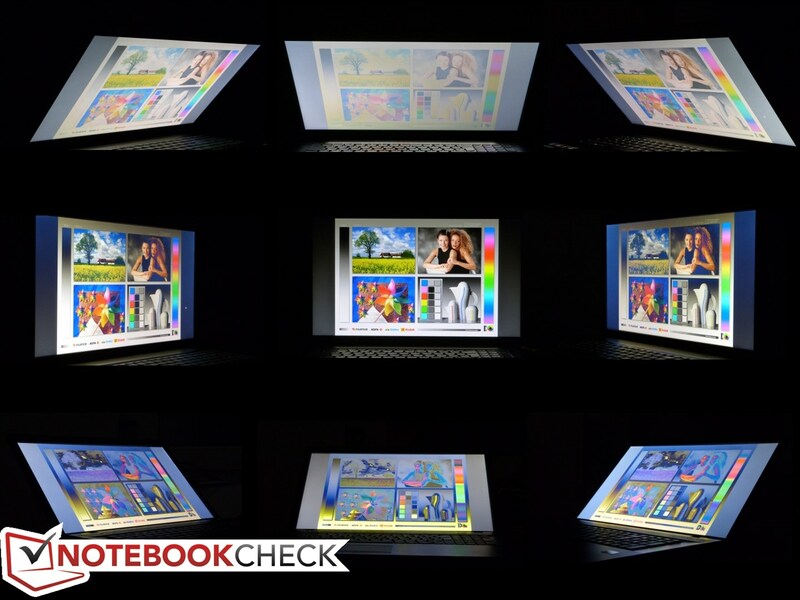 Considering the price range of the notebook there are no surprises: TN technology with limited viewing angles and a mediocre color space combined with a weak contrast ratio and a low brightness. We noticed a distinct blue cast of the display, which results in a very cool picture. The poor black value is another drawback - black colors are always covered with a gray film. This is especially annoying during movie playback. However, the blue cast is not the only problem of the G700, the contrast ratio of 279:1 is also mediocre at best. One reason for this is the black value of 0.89 cd/m²; the picture never appears really dark, even under perfect conditions. Professional picture editing is not possible with the G700 because of the low performance and the display is not really suited for that, either. It only covers 51% of the of the AdobeRGB color space. However, the device is not intended for professional graphic designers. Because of the glossy display surface and the low brightness, the G700 is not suited for outdoor use. Even bright indoor environments, like well-lit offices, result in annoying reflections. We already mentioned that the Lenovo G700 uses a TN display and the viewing angle stability is accordingly not overwhelming. To be honest, you should not really try to deviate from a center viewing position. Even small changes of the viewing angle result in an inverted picture - other persons should be behind you if you want to show them some pictures or movies. Barely visible: Windows 8 under direct sunlight. 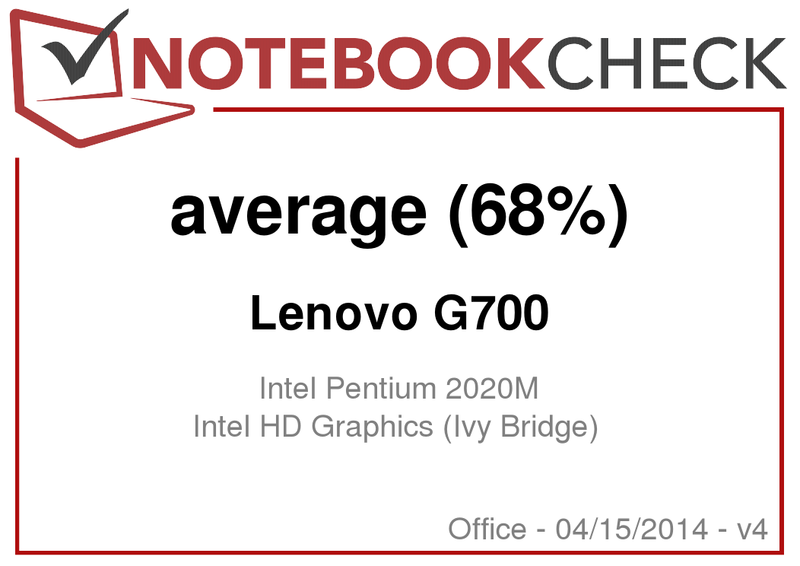 The low price of 399 Euros (~$532) already suggests it and a look at the technical data confirms it: Lenovo's G700 is certainly not a high-end notebook with sufficient performance reserves. It is intended for light office tasks and web browsing but you should avoid complex 3D applications, video editing or more demanding picture editing. Lenovo does also offer more expensive configurations of the G700 with faster processors (i3-3110M, i5-3230M, i7-3612QM), more storage capacity (maximum of 1 TB) and dedicated graphics cards based on entry-level GeForce chips. Our review unit uses a Pentium 2020M processor with a maximum clock of 2.4 GHz. Its two cores can reduce the clock to save energy but they cannot increase the clock to improve the performance (no Turbo Boost). The processor is manufactured in the latest 22 nm process and the inner architecture is based on the Ivy Bridge architecture. Despite the average performance, Intel specifies the TDP as 35 Watts. The performance difference to a Core i processor can be extreme and is perceptible with daily tasks, not only in benchmarks: Intel's Pentium slows down application starts and creates delays during work. Even a Core i3 offers significantly more performance; you should only choose the Pentium if you really cannot get another (and more expensive) configuration. We could not determine any issues with throttling in our tests, even under high and continuous load on a hot summer day with ambient temperatures of 30 degrees Celsius (86 Fahrenheit). The performance is not reduced on battery power (setting: Maximum Performance). PCMark Vantage and PCMark 7 do not show any surprising results; similarly equipped notebooks are neither surprisingly faster nor slower. Compared to the older Pentium B980, there is a small performance increase but it is not perceptible in practice. Faster processors like Intel's Core i3 or i5 offer more performance, which improves application starts and smooth handling. An SSD solution as a cache for often-used applications is not available for the G700. The hard drive has to manage all the data on its own, which works surprisingly well. But even the fastest hard drive can accelerate neither the weak processor nor the slow integrated graphics. The G700 is quickly at its limit if you try to start applications that are more complex or execute tasks that are more demanding. Similar to the Asus F75A, for instance, the notebook is best suited for light office tasks. The hard drive of the G700 was snappy in our test with a maximum transfer rate of 107.7 MByte per second. The average performance of 74.4 MB/s is also very good, especially considering that there were deviations downwards because the operating system accessed data during the benchmark. It is not surprising then that the minimum transfer rate is just 1.5 MB/s. Graphics are handled by the integrated HD Graphics of the Pentium 2020M. This GPU is one step below the Core i processors based on Sandy Bridge and only offers limited 3D performance. The GPU does not have dedicated memory and has to use shared memory from the single channel RAM. The clock fluctuates between 350 and 650 MHz and dual channel memory would improve the performance of the integrated GPU compared to the single channel solution. With such a slow graphics solution it almost does not matter if comparable notebooks are a few percent faster or slower than the G700 - games are not running properly even with lowest details. The latest 3DMark refuses to run and games like GRID2 produce graphical errors. The question of which games can be played with the Lenovo G700 is almost unnecessary considering the poor 3D performance of the integrated HD 2500 GPU. Apart from older or very undemanding titles, there is hardly any game with playable frame rates. GRID 2, which has even been optimized by Intel for integrated HD Graphics, can be played with a reduced resolution and minimum details but it is not very enjoyable due to the continuous graphical errors. If you want to use the G700 for occasional gaming sessions, you should really be a fan of 2D shooters, retro-titles or hidden object games. Notebooks with a small, dedicated GPU like the Asus F75VC or configurations of the G700 with a GeForce GPU are much better suited for gaming. The DVD drive is almost silent. The fan of the G700 is always running but the noise development is quite acceptable. The notebook is audible in quiet environments with 30.6 dB(A); you should definitely check it out before you buy it if you are very sensitive in this regard. However, even slight ambient noise covers the unobtrusive murmur of the fan. With just 32.1 dB(A), the device is also very reasonable under load and not much noisier than during idle. We were especially impressed by the low operating noise of the DVD drive: We could barely hear the drive even during movie playback from a scratched DVD. The measurement result of 34.7 dB(A) confirms this impression. Intel specifies the TDP of the Pentium 2020M as 35 Watts - as a result, the cooling system of the G700 has to be able to dissipate this heat. The actual energy consumption of the processor should also be much lower even under maximum load. 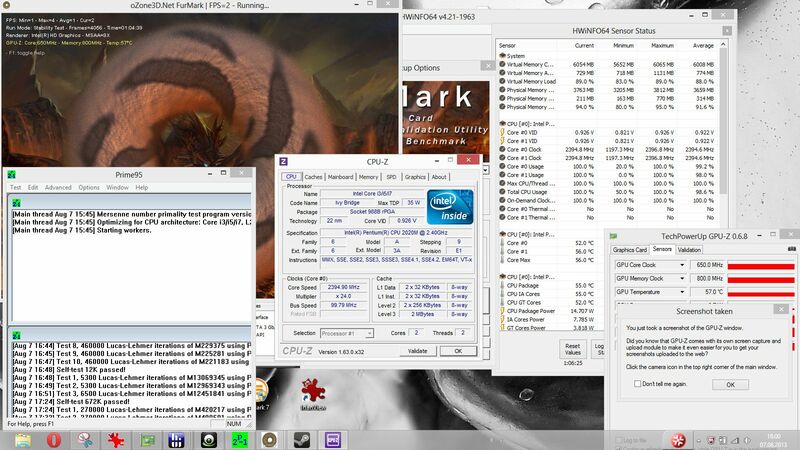 The result is the very low temperatures of the notebook - even after the one-hour stress test with FurMark and Prime95, the device only warmed up to a maximum temperature of 44.5 degrees Celsius (112.1 Fahrenheit) in the area around the fan. Throttling was no problem in our tests; the cooling system is sufficient and has no problems with continuous processor load. (±) The maximum temperature on the upper side is 44.5 °C / 112 F, compared to the average of 33.9 °C / 93 F, ranging from 21.2 to 62.5 °C for the class Office. Considering the price and the performance class of the G700, the sound from the stereo speakers is reasonable and the sound experience is improved by Dolby Advanced Audio 2. Although it certainly does not replace a real stereo system, the speakers are sufficient for the occasional music or movie playback. The energy consumption of the G700 is very modest during idle. The dark screen admittedly does not really draw much power for the background illumination, but the consumption of 12 Watts with maximum display brightness is reasonable. High load for the CPU and GPU leads to a maximum consumption of 35.7 Watts. Notebooks with a dedicated GPU consume almost twice as much energy under load - for example the Samsung 300E7A. The result during standby is very good with just 0.1 Watts. The 44 Wh battery certainly benefits from the frugal components of the G700. The notebook managed more than 13 hours in the Reader's Test (minimum display brightness, energy-saving profile, deactivated WLAN). Our WLAN scenario is more realistic and refreshes a web page (including videos and advertisements) every 40 seconds. The result is 5:16 hours, which is very good. You can watch movies for around 3 hours and the G700 has to be recharged after 72 minutes under maximum load. 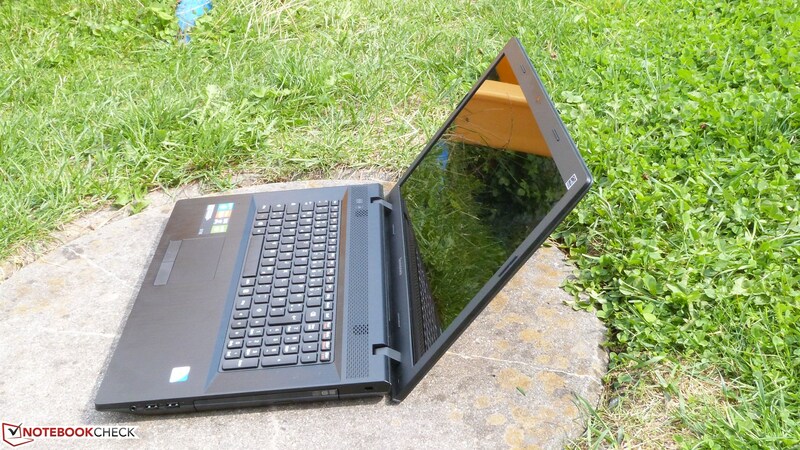 If you do not want to spend much money for an office notebook, the Lenovo G700 is definitely worth considering with its good battery runtimes, the solid build quality and the good keyboard. However, the weak processor and the below average display are drawbacks and might justify the additional charge for a better-equipped notebook. 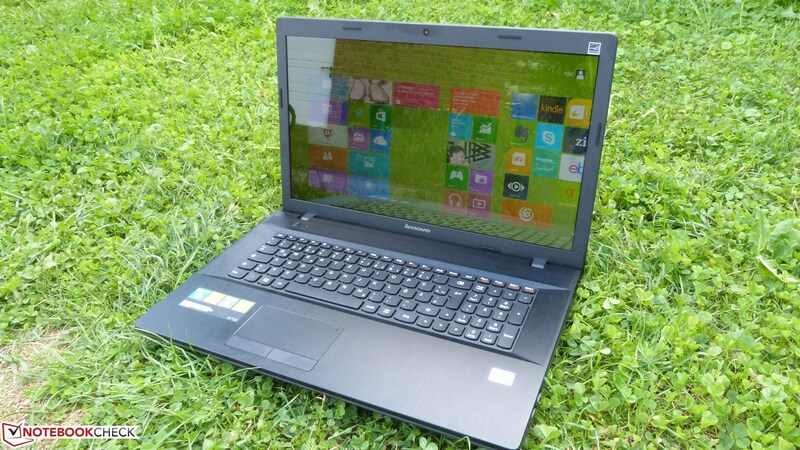 The Toshiba Satellite Pro C870, for instance, offers better application performance and has a matte display that can be used outdoors. 3D applications, complex video editing and (professional) picture editing are not the strong suit of the G700. It is better suited for typing, web browsing or music playback. We have to praise the excellent maintainability of the notebook: Just loosen two screws and you can access all the important components. The noise development of the G700 is also very modest, especially when you use the DVD drive. The poor WLAN performance and the inconvenient port layout leave a bad impression; the otherwise comparable Asus F75A is better in this regard. You can use the F-keys as multimedia controls via Fn-key. Unfortunately the numeric keypad is not very sophisticated - it takes some time getting used to. ... and the SD slot, which is unfavorably placed. The easy maintainability is however convenient: The bottom is fixed by just two screws. 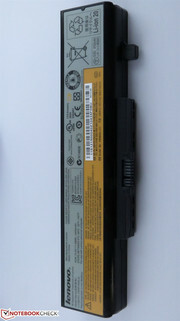 ... and also the BIOS battery (type 2032). The same applies for the hard drive. Even the processor is accessible for experiments. One memory slot is empty, the other slot is occupied by one DDR3-1600 module with 4 GB. The case without the bottom cover. The battery provides good runtimes, at least in office scenarios and with DVD playback. The G700 is not a good notebook on the go: Too many reflections from the display. The 65 Watt power supply unit is sufficient. Convenient: The Backup button next to the Power button. The resolution of 1600x900 is nothing special for a 17.3-inch display. The display has a thin plastic bezel. The brightness is sufficient indoors. The serrated bottom looks nice - as long as there are no fingerprints. 10/100 Mbit/s Ethernet is not up-to-date anymore. The fan gets the fresh air from the bottom. The stereo speakers produce a good sound. The G700 is well suited for presentations and connections with projectors thanks to VGA and HDMI. The 1.2 megapixels webcam with an average picture quality. You can use the display as a mirror outdoors. 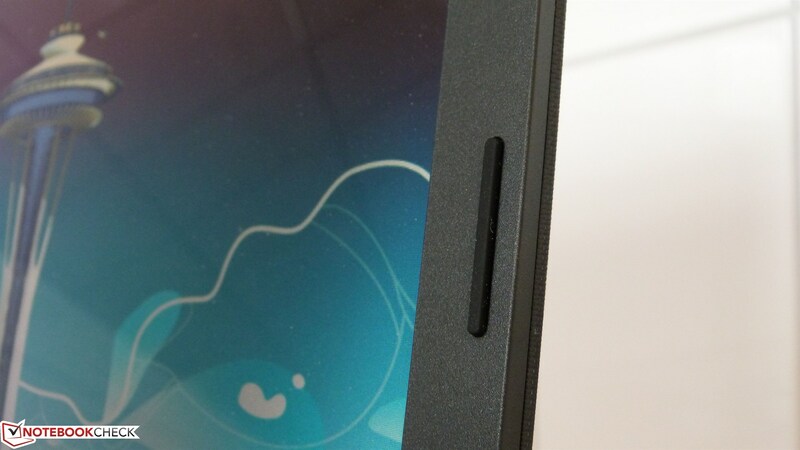 Maximum opening angle of the display. The battery runtimes and the low system noise of the G700. A better WLAN module, Gigabit LAN and slightly more performance. The maintainability of the good case is excellent, the fan can be cleaned very easily. The Asus F75A offers a better port layout and better WLAN performance but uses an older Pentium CPU. 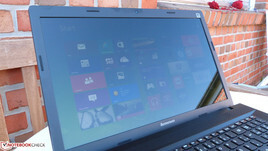 The Toshiba Satellite Pro C870 convinces with more performance and a matte display, but is also slightly more expensive.